To fulfill the needs of higher power required PoE network applications with Gigabit speed transmission, PLANET SGSW-24040HP is the 24-Port Gigabit High Power over Ethernet Managed Switch which features high performance Gigabit IEEE 802.3af PoE (Up to 15.4W) and IEEE 802.3at High-Power PoE (Up to 30.8W) on all ports. By supporting reliable stacking technology and advanced networking features, the SGSW-24040HP also provides high scalability for current and future network infrastructure as it can flexibly work with PLANET SGSW series Gigabit Switch to meet the various networking requirements and simplify the network deployment and management. A maximum of 30.8 watts is available on the Gigabit ports of the SGSW-24040HP for powering PDs (Powered Devices), with a maximum PoE delivery of 360 watts for all ports to per device in order to satisfy the increasing needs of power consumption by powered devices. Providing Gigabit throughput and high power supply, the SGSW-24040HP optimizes the installation and power management of network devices such as 11n wireless access points (AP) with Gigabit PoE LAN port, security PTZ (Speed Dome) network video cameras, large screen PoE video phones, thin-clients and more. The SGSW-24040HP provides built-in SMTP and SNMP Trap alarm function that can send instant alarm to the administrators by email when errors happen. The errors like when the connected PD devices such as IP cameras or wireless access point were changed or when the Ethernet cable was broken or loosened, the SGSW-24040HP would detect it and spontaneously send the error alarm to the assigned receiver or network management center. It also records when the error and the recovery status happen. Under the trend of energy saving worldwide and contributing to environment protection on the Earth, the SGSW-24040HP can effectively control the power supply besides its capability of giving high watts power. The “PoE schedule” function helps you to enable or disable PoE power feeding for each PoE port during specified time intervals and it is a powerful function to help SMBs or enterprises save power and money. The SGSW-24040HP works with original network structure (IPv4) and also supports the new network structure (IPv6) in the future. With easy and friendly management interfaces and plenty of management functions included, the SGSW-24040HP is the best choice for System Integrators to build the large wireless service and for SMBs to connect with the IPv6 network. The SGSW-24040HP provides 2 dedicated high-speed HDMI-like interfaces for stacking management. By applying the SGSW-24040HP, up to 16 units of stacking, 384 Gigabit PoE ports can be managed by a stacking group and additional ports and functionality can be added as needed. 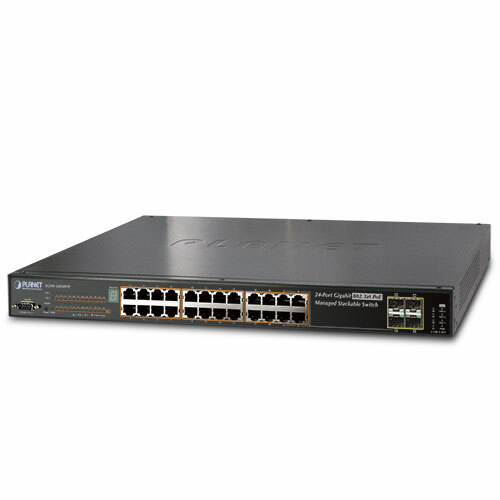 The 2 built-in stacking ports provide 5Gbps bandwidth and up to 20Gbps bi-directional speed. It can handle an extremely large amount of data in a secure topology linking for backbone or high capacity network server with 68Gbps switching fabric per unit. The stacking technology also enables the chassis-based switches to be integrated into SGSW-24040 series Managed Switch at an inexpensive cost. The SGSW-24040HP can be programmed for advanced switch management functions such as dynamic Port link aggregation, Q-in-Q VLAN, private VLAN, Multiple Spanning Tree Protocol (MSTP), Layer 2 to Layer 4 QoS, bandwidth control and IGMP Snooping. The SGSW-24040HP provides 802.1Q Tagged VLAN, and the VLAN groups allowed will be maximally up to 255. Via aggregation of supporting ports, the SGSW-24040HP allows the operation of a high-speed trunk to combine with multiple ports. It enables a maximum of up to 12 groups of 16 ports for port link aggregation and supports fail-over as well. For efficient management, the SGSW-24040HP is equipped with console, WEB and SNMP management interfaces. With the built-in Web-based management interface, the SGSW-24040HP offers an easy-to-use, platform-independent management and configuration facility. The SGSW-24040HP supports standard Simple Network Management Protocol (SNMP) and can be managed via any standard-based management software. For text-based management, the SGSW-24040HP can be accessed via Telnet and the console port. Moreover, the SGSW-24040HP offers secure remote management by supporting SSH, SSL and SNMPv3 connection which encrypt the packet content at each session. The SGSW-24040HP offers comprehensive Layer 2 to Layer 4 Access Control List (ACL) for enforcing security to the edge. It can be used to restrict network access by denying packets based on source and destination IP address, TCP/UDP ports or defined typical network applications. Its protection mechanism also comprises 802.1X Port-based and MAC-based user and device authentication. With the private VLAN function, communications between edge ports can be protected to ensure user privacy. The SGSW-24040HP Net Security also provides DHCP Snooping, IP Source Guard and Dynamic ARP Inspection functions to prevent IP snooping from attack and discard ARP packets with invalid MAC address. The network administrators can now construct highly secured corporate networks with considerably less time and effort than before. The four mini-GBIC slots built in the SGSW-24040HP support dual-speed, 100Base-FX and 1000Base-SX/LX SFP (Small Form-factor Pluggable) fiber-optic modules, meaning the administrator now can flexibly choose the suitable SFP transceiver according to the transmission distance or the transmission speed required. The distance can be extended from 550 meters (Multi-Mode fiber) up to above 10/50/70/120 kilometers (Single-Mode fiber or WDM fiber). They are well suited for applications within the enterprise data centers and distributions. High power and high speed data switching are integrated into one unit and delivered over a single cable. The Gigabit PoE Switch also lowers the need for dedicated electrical outlets on the wall, ceiling or any unreachable place and eliminates costs and time for additional AC wiring. Providing up to 24-Port Gigabit high-power PoE, in-line power interface, the SGSW-24040HP High-Power PoE Switch can easily build a central-controlled power network with wireless Gigabit AP, IP phone system, or mega-pixel IP camera system group for the enterprises. For instance, 24 IP cameras and wireless APs can be easily installed around the corner in the company for surveillance demands or a wireless roaming environment in the office. Without the power-socket limitation, the stackable PoE Switch makes the deployment of IP cameras or WLAN AP more easier and efficient. While video surveillance system becomes more and more important for visible security in the factory, warehouse, and public places, the IP cameras with PoE function would be a lot helpful for the surveillance deployment when the power outlet is not easily found in the ceiling or in the outdoor. For example, in the factory operation or in the warehouse storage security, the PoE IP camera can be installed anywhere regardless of the restrictions of power outlet location. With the PoE Switch SGSW-24040HP acting as the central control manager and offering remote power monitoring via Web interface or SNMP trap and SNMP monitoring, the manager can get the PoE devices status and alert immediately. The PoE IP cameras can also be controlled remotely, which increases the administrator management efficiency and improve the productivity.